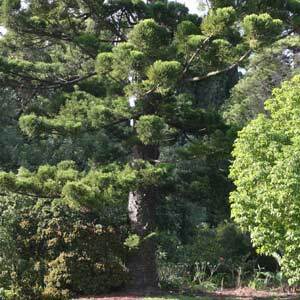 Araucaria cunninghamii is the Hoop Pine which is a tall growing tree to 40 – 50m. Also known as the Queensland pine it was widely valued for its timber, especially for furniture. Native to the coastal rainforest’s from Northern New South Wales though to Northern Queensland. This is tree that grows well in tropical conditions, however it also grows well in cooler climates. Like many of its relatives the foliage is prickly, however Araucaria cunninghamii does have a good branch structure and is used widely as a windbreak tree as well as a large feature tree. Growth rate at first is slow, however once it settles in growth is faster. Appropriate fertilizer over the first 10 years will enhance growth. This is a large tree that will reach between 20 and 40m in height depending on conditions and climate. It does prefer full sun but will cope with some shade. It grows well in coastal conditions and does not seem that fussy about soil types, although heavy waterlogged soils can be a problem.